Netherlandish painter, part of whose career was spent in Italy, where he was known as Giusto da Guanto (Justus of Ghent). 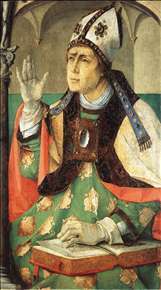 He became a member of the Antwerp Guild in 1460, but by 1464 had moved to Ghent, where he was a friend of Hugo van der Goes. At some time after 1468 he went to Rome, and by 1472 had settled in Urbino, where he worked for Duke Federico da Montefeltro. 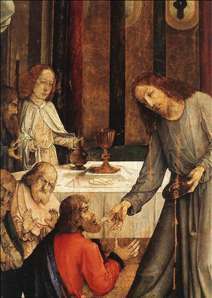 Joos s only documented work is The Communion of the Apostles (also known as The Institution of the Eucharist, 1472-74), which is still at Urbino, in the Galleria Nazionale. 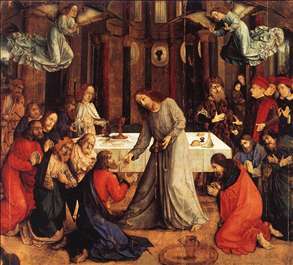 Like Hugo s Portinari Altarpiece, it was an important work in spreading knowledge of the Netherlandish oil technique in Italy. Of the other works attributed to Joos, the most important are a series of twenty-eight Famous Men (Galleria Nazionale, Urbino, and Louvre, Paris), commissioned for the Ducal Palace. 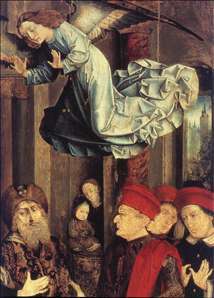 Their authorship is controversial, and they may have been a work of collaboration between Joos and the Spanish painter Pedro Berruguete. See more details about "The Institution of the Eucharist"
See more details about "The Institution of the Eucharist "
See more details about "St Augustine"